Lake Tahoe -- Big Blue, as it is referred to by many -- is North America’s Largest Alpine Lake and the Jewel of the High Sierra ... and the Reno Tahoe Territory of the Nevada Commission on Tourism and Bike the West invites you to experience the adventure of riding your bicycle around her 72-mile shoreline by participating in the 15th Annual Tour de Tahoe – Bike Big Blue. Bike the West has been producing America’s Most Beautiful Bike Ride – Lake Tahoe for the past 25+ years and has gained a reputation as being one of best Spring rides in the country. It continues to sell out year after year leaving many riders not able to participate. This is your chance to ride around Lake Tahoe at Summer’s end offering fresh mountain air, incredible scenic beauty, great food & entertainment and managed and supported by one of the most experienced bicycle event management teams in the West. Bike the West & Tour de Tahoe Bike Big Blue continues to promote the Lake Tahoe Bikeway, in conjunction with the Lake Tahoe Bicycle Coalition. 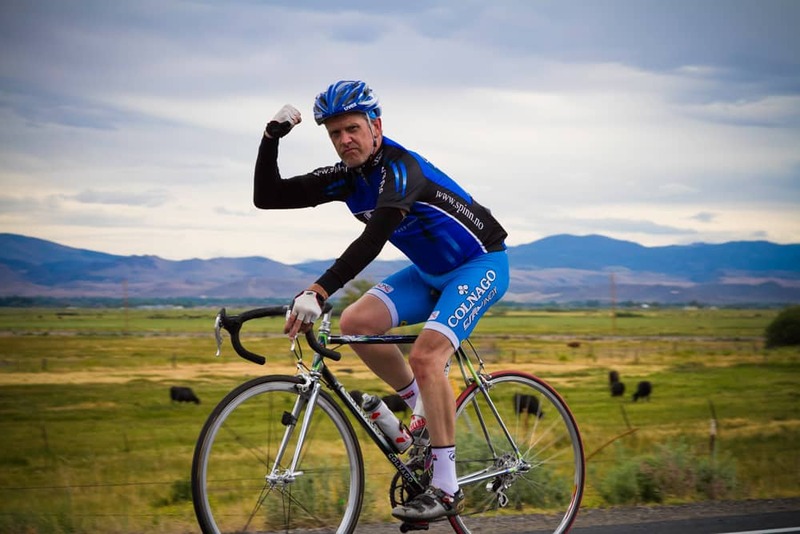 Dedicated to enhance bicycling safety, facilities and to promote the building and connecting existing bike lanes around Lake Tahoe and to develop an alternative non-motorized transportation corridor to help protect Lake Tahoe’s environment. If you enjoy riding your bike around Lake Tahoe, please help us to continue our work by joining and supporting this vision. Click on the Logo for information and membership. Founded in 1966 from a tiny classified ad in a Portland, Oregon, newspaper, NPF has evolved to become the leading patient advocacy group for the more than 8 million Americans living with psoriasis and psoriatic arthritis. As emerging research continues to demonstrate the serious, systemic effects of these chronic autoimmune diseases, our highest priority is to find a cure. Tour de Tahoe - Bike Big Blue will take place rain or shine. Event organizers have the right to delay the start time or alter the course options should possible inclement weather present it self on ride day. Please continue to check this website for updates the week prior to the event. You may also "Like" our Facebook Page to receive updates and information on the ride or to communicate with ride organizers and other friends that my be attending. facebook.com/bikelaketahoe Tour de Tahoe will Start and Finish in “Parking Lot C” of the the Hard Rock Hotel & Casino Lake Tahoe on Highway 50, Stateline, South Shore Lake Tahoe, Nevada. Bike the West is extremely pleased to be hosted by the Hard Rock Hotel & Casino Lake Tahoe as they have invested $60 Million in a complete renovation of the property. and will be offering an outstanding updated venue with a variety of restaurants, lounges, gaming and newly renovated accommodations. We are also pleased to stage our Tour de Tahoe - Bike Big Blue, After Ride Meal & Party at the Hard Rock Hotel & Casino Pool. Call 1-844-588-ROCK (7625) for reservations or visit their website at: www.hardrockcasinolaketahoe.com and ask for the Tour de Tahoe room rates. (Code: TOURTAHOE19) Rooms for this event are limited and reservations must be made by August 12, 2017 to take advantage of these special rates. *Hard Rock Hotel will allow participants to store bicycles in their hotel rooms (some restrictions apply). The 72-mile Tour de Tahoe – Bike Big Blue course circumnavigates the highways clockwise around Lake Tahoe in both Nevada and California. It includes a challenging 800-foot climb to a rest stop overlooking Emerald Bay and a 1,000-foot climb to Spooner Junction. There are also many short rolling ascents and descents totaling over 4024 vertical feet of elevation gain! The altitude ranges between 6,300 feet and 7,100 feet above sea level and the ride is recommended for conditioned recreational bicyclists, not for beginners. Participants must be at least 14 years of age (no children, please) and must be experienced in riding roadways. Bike the West is pleased to bring back the Boat Cruise - 35 Mile ride to offer a unique and shorter ride distance. There are limited spots for this ride option. Rest stops with a great selection of food and beverages are offered overlooking Emerald Bay, Tahoe City, Kingsbeach (Lunch), and Water Stop at Half Spooner and at Spooner Junction. Drop bags will be provided at the first two rest stops if you chose to discard clothing. Please include your Pull Tag Drop Bag Number from your Event Number in your Drop Bag and write your name & number on the Drop Bag. First aid and technical support are provided at rest stops and on the course. SAG Transport Support Service is also provided to transport you forward to the next Rest Stop, but may be subject to delayed returns to the Finish and course sweep. Cut-off times are established at various points and at each rest stop where ride organizers reserve the right to ask "behind time" participants to sag forward. A variety of non profit organizations manage and sponsor the Rest Stops and other services on the course to include members of: The Tahoe Amateur Radio Association, Kiwanis Club of Tahoe Sierra, Bijou Community School, Lake Tahoe Wildlife Care, Rite of Passage, Lake Tahoe Bicycle Coalition, Tahoe Blue Riders Motorcycle Club, Barton Health / Tahoe Center for Orthopedics, Douglas County Search & Rescue and many others. Tour de Tahoe Pre-Registered Rider Check-In will take place from 12 noon until 8 pm on Saturday, September 7, 2019 at TAHOE SPORTS LTD, located in the Village Shopping Center at Highway 50 & Heavenly Village Way in South Lake Tahoe, two stop lights from the Stateline Casinos on the California side. All participants will be required to sign an Accident and Release of Liability Waiver upon check-in. All participants will receive a Lake Tahoe Welcome Goodie Bag, Event Number, Event Wrist Band, Event T-Shirt, Finish Medal, Food & Beverage at up to 5 rest stops, including Lunch on course, Tech Support at each rest stop, SAG Transport Support Services if needed, plus After Ride Meal Pool Party with Live Entertainment. Plus, A complimentary bicycle safety inspection is offered during this check-in period. Make sure you check out the great "Tour de Tahoe" Sale going on this weekend. Also, don't miss our Sponsors and Vendor Expo here and at the finish line on ride day. Pre-registered rider check-in will reopen at 5:30am on Sunday, September 8, at the Hard Rock Hotel & Casino, back parking lot C. Late / Same Day on site registration may be available, space permitting, with late fees. Free parking is available in all other back parking lots as well as the Parking Garage (check your roof rack space). It is recommended that you enter the parking lots from Lake Parkway Drive across from Edgewood Golf Course. All 72 mile riders have four 15 minute start windows from 6:30am to 7:30am. You must indicate your Start Time preference on your registration application or you will be assigned the earliest start window for your ride option. The highways around Lake Tahoe are for the most part extremely narrow and some with little to no shoulder. For Tour de Tahoe all highways are open for vehicle and bicycle traffic in both directions. So please be prepared to SHARE THE ROAD. The ride features an After Ride Pool Party with a delicious meal and live band with Deep Fryed Mojo in the Swimming Pool area at the Hard Rock Hotel & Casino. This is included with your registration fees. Additional After Ride Party Meal Tickets are available to purchase for guests when you register online or at event check in. You must present your Pull Tag Meal Ticket from your event number to attend. Additional meal tickets are available to purchase for guests at event registration. Event photos will also be available from Captivating Sports Photos who will take your pictures on the course. These photos will be FREE to download compliments of Bike the West. The link for download will be shared within a few days after the event. To keep informed on ride details, please "Like" our Bike the West Facebook Page for updates. Please remember to pick up your drop bag in the finish area if you leave clothing / items at rest stops. Please visit and enjoy shopping with our sponsors and vendors at the Finish Line Expo. YOU MUST PULL OFF THE ROAD SURFACE AND STOP, IF NECESSARY TO ALLOW EMERGENCY VEHICLES TO PASS. PLEASE BE COURTEOUS OF VEHICLES TURNING ON TO THE COURSE FROM SIDE AND CROSS STREETS. There are other Rules of our Ride that include wearing a helmet and no head phones and others for your safety that are not listed above. Please understand that registration and participation in this event does not entitle participants to violate the Rules of the Road / Ride, nor in ANY WAY allow for unsafe riding.